This tip will show you how you can set up e-mail and SMS reminder notifications for tasks and appointments. This tip will show you how you can schedule an e-mail message to be sent at a later date and time. 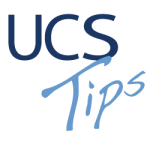 This tip will show you a few methods for creating appointments using the mini calendar within UCS. This tip will show you how to import/export your calendars in the iCalendar .ics format, which allows you to import calendars or appointments, and export your calendar for import into another calendaring system.